We're a one stop shop , We have it all! 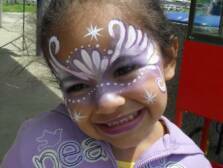 We can provide several different types of entertainment for your birthday or special event . - Comedy Magic Shows with live animals ! From small birthday party shows performed right in your living room to big stage shows for schools and other events. Also available: Clown, Pirate or Wizard themed magic shows and other special themed shows for Halloween and Christmas or other holidays or events. great for parties or other events. 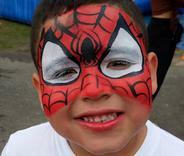 - Facepainting professional ,full face designs, hand and cheek art with high quality, hypoallergenic,waterbased paints. - Airbrushing -They look like real tattoos and they're waterproof ! great for pool parties! - Balloon Sculptures -We can sculpt a very wide variety of figures using Qualatex balloons. - Balloon Decorating We can make balloon arches, columns,table centerpieces and other things to decorate your party or event with helium quality latex and mylar balloons. 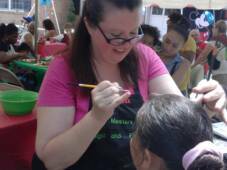 - Clowns ,Princesses ,Super Heroes and other costumed characters.Our facepainters and balloon artists will also come in costume for holiday events and other themed parties. - DJ's to play your favorite party music and games. - Karaoke You become the star with our karaoke. - Fun Party Games and Dancing with MC Games like inflatable pin the tail on the donkey,Limbo,Hot Potato, etc. and line/group dancing hosted by one of our entertainers. - Spin Art Make your own art with our spin art machine. - Sand Art Have fun making your own sand art bottle or necklace. - Stilt Walkers great for parades and special events. - Dunk Tank great summertime fun ! - Giant Castle Combo Bounce and Slide. -Other Entertainment: We network with a lot of other professional entertainers so if you are looking for something else like Caricature Artists, Palm Readers, a Petting Zoo, Photo Booth or Inflatable Movie Screen or other entertainment not listed, just ask and we will do our best to get it for you.